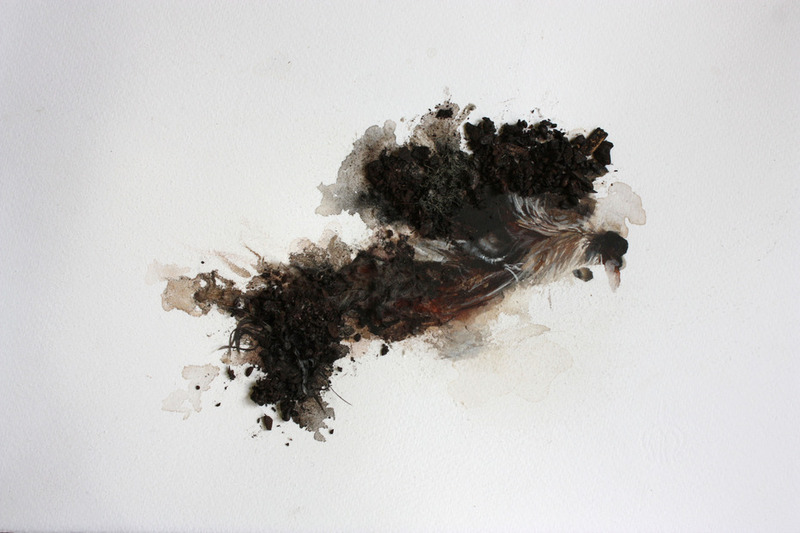 Rebecca Armstrong, Untitled, watercolour, gouach, dirt, feathers, thread, 300 mm x 150 mm"
It was very hard to translate the work of another artist. When you approach a work of art, you always bring your view of the world and experiences and socio economic status with you. You can of course create a story or an idea in your mind about what the artist is trying to communicate, but there is always a chance you have it all wrong, or a bit wrong or a bit right, or that there was never a meaning to begin with. There are however certain trigger points in works of art which give you small clues. It was a lot of fun to try and break down the work and its possible meaning; however it requires a lot of thought and a lot of talking. I talked to a lot of people about it, which is a great thing for an artwork to do, make people communicate and express their opinions and feelings. So that part of the project was great. In creating my own response, that was a bit harder as it was a different process of working that I normally use; normally I have a broad subject that drives my work, and use visual references and material to drive my processes; this time I basically had a message and it was like “How do I make this message which seems to be words in my head into a visual message to pass on to another artist?” So a part of me had the message in mind and the other part of me flowed with my process.